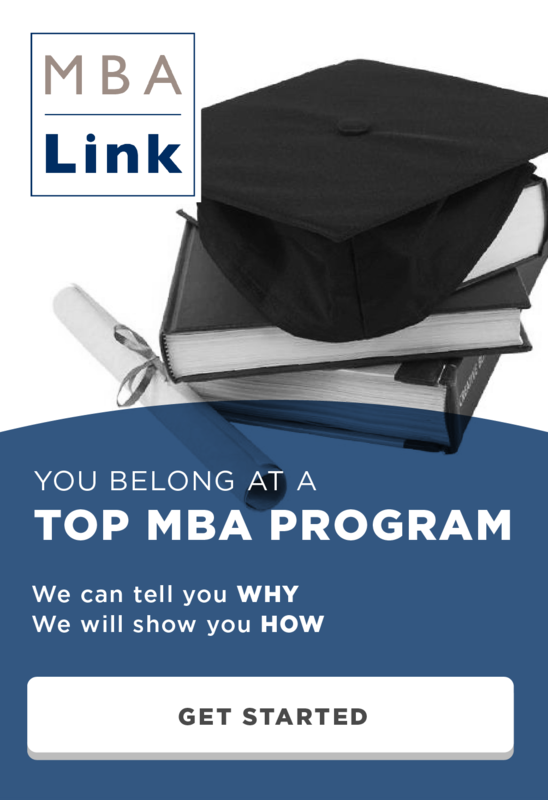 The final decision for the Tuck MBA January round applications is being released tomorrow. 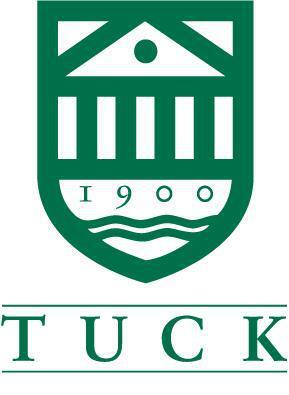 Tuck calls the students who have been accepted either the day of or the day before the decision is released. Today, mostly international acceptance calls were made, and I have not been called yet. I am based in the US so I am not super nervous yet, but I am finding it difficult to think of anything other than the Tuck decision. I was incredibly unproductive at work today because I spent the entire time hoping my phone would ring. To help ease my worries I created this elaborate Tuck admissions analysis to try to figure out my chances of getting in. 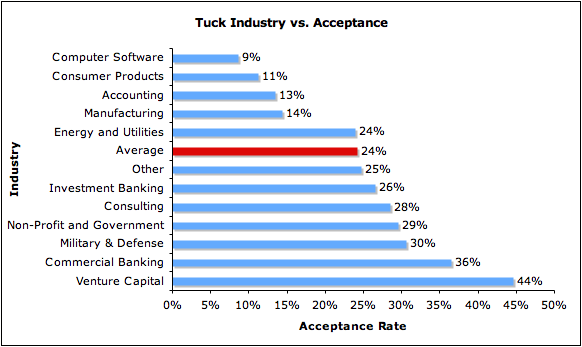 Each of the following graphs are only acceptance rate vs. one variable. In reality there are probably interaction effects between different variables, so this is by no means especially accurate, but my final conclusion is that I have a 53% chance of being admitted. I was hoping the number would come out higher, but it is a lot better than the 20.8% acceptance rate overall at Tuck. The first variable I looked at was GMAT. I did a scatter-plot by acceptance rate and found the best trendline for fitting the trendline. This line has an R squared of .82, which is a fairly strong correlation. I then created the smoothed out graph below, which probably does a better job of estimating the impact of GMAT on your application odds. 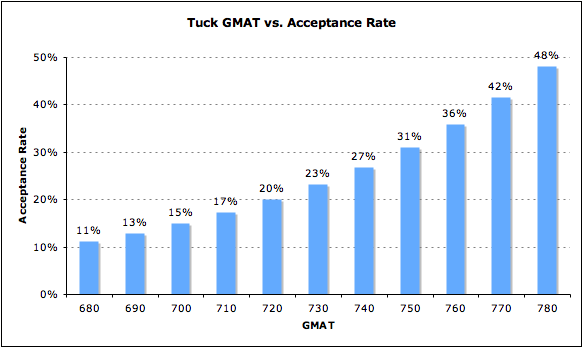 My 770 on the GMAT really helped to boost my Tuck admissions chances since it is significantly higher than the 718 average. However, I know my GPA is below the average Tuck GPA of 3.5. 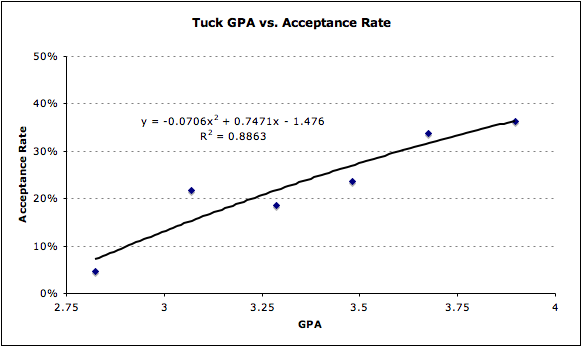 So next I looked at how GPA impacts acceptance rate. For Dartmouth, GPA is highly correlated with chance of acceptance, as one would expect. The GPA scatter-plot has a .89 R squared, which is very high. However, the line is not nearly as steep as it is for GMAT. Similar to GMAT, I smoothed out the curve to account for noise and came up with the graph below. 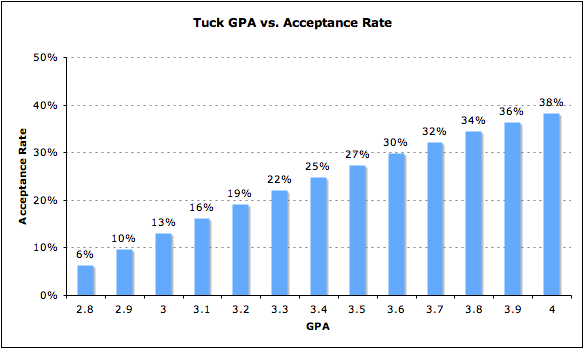 After GPA, I looked at how your industry impacts your chances of getting into Tuck. I only included an industry if it either had a high number of applicants or had a very high acceptance rate, like Venture Capital and Commercial Banking. I lumped all other industries into “other”. The trends for Dartmouth are similar to what I saw in my Wharton industry analysis. Manufacturing fared better with Tuck, but it is still significantly below average. Finally, I looked at Dartmouth acceptance rate by years of work experience. The results of this graph do not seem to be as conclusive as other variables. The acceptance rate kind of jumps around. My interpretation is that in general the more years of work experience, the higher your chance of admissions is, until you reach 9+ years. Then the admissions committee starts to wonder why you are even applying for an MBA. All in all, my predicted chance of getting into Dartmouth is pretty decent at 53%. My chance is theoretically a little better than a flip of a coin. I know that very few people who don’t do a applicant initiated interview are invited to a Tuck interview. An admissions committee member told me that roughly 55% of applicants self-initiate interviews, and I am going to guess that only 5% of total applicants are invited. If this is correct, then the fact that I already interviewed means that I have a pretty good chance of getting in. On top of that, I had one recommender who wrote an amazing recommendation for me. I sent it to NYU, Wharton and Tuck. I was admitted to NYU and I have been interviewed at Wharton and am waiting for my final decision. I was rejected from every school that he didn’t recommend me at. I am hoping the trend continues that I get into every school that my super recommender submitted to. For those of you who are still waiting for the Tuck admissions decision, I hope that this article is able to distract you for a little while while you wait for the decision tomorrow. I wish everyone the best of luck. 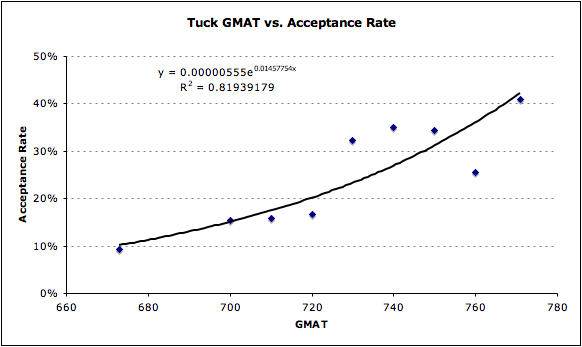 The data used to create this Tuck admissions analysis is from GMAT Club. I used the data from the class of 2014, 2015 and the first two rounds of the class of 2016. This entry was posted in Admissions, GMAT, GPA, MBA, Tuck and tagged Admissions, GMAT, GPA, Industry, Interview, MBA, Tuck on March 14, 2014 by Data Guru. So, what’s the final verdict on the results for you? I was wait listed. I took my self off the wait list and went to NYU. Congrats! Stern is a great school and definitely not easy to get into! By the way thank you for this website it’s incredible! 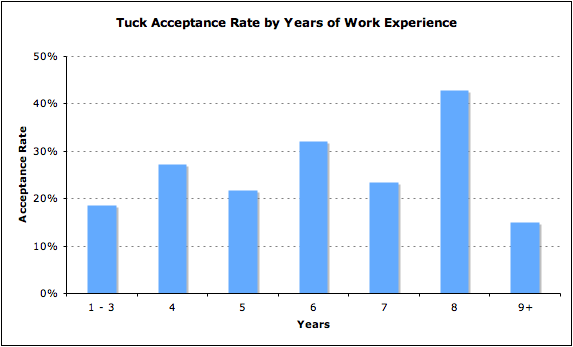 Great post – any insights regarding acceptance rate by round at tuck? Round 1 and 2 have pretty decent acceptance rate of around 24%, then it drops off a bit for round 3 and then plummets for round 4. Good Luck!